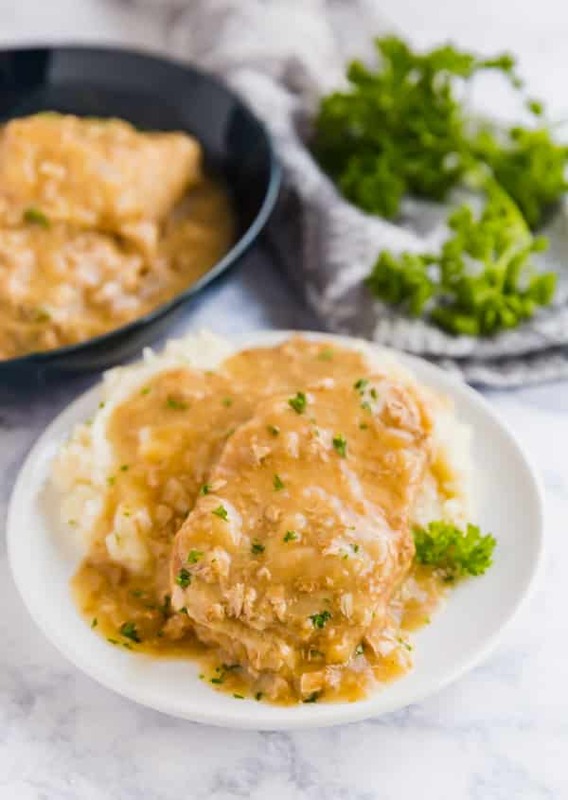 Say goodbye to dry and tough pork chops: these Smothered Crock Pot Pork Chops are the ultimate fall-apart tender comfort food. With just 4 ingredients, this easy dinner will be your new go-to dump dinner! As you probably know by now, this recipe is part of my Dump It ‘Til It’s Hot series of dump recipes. 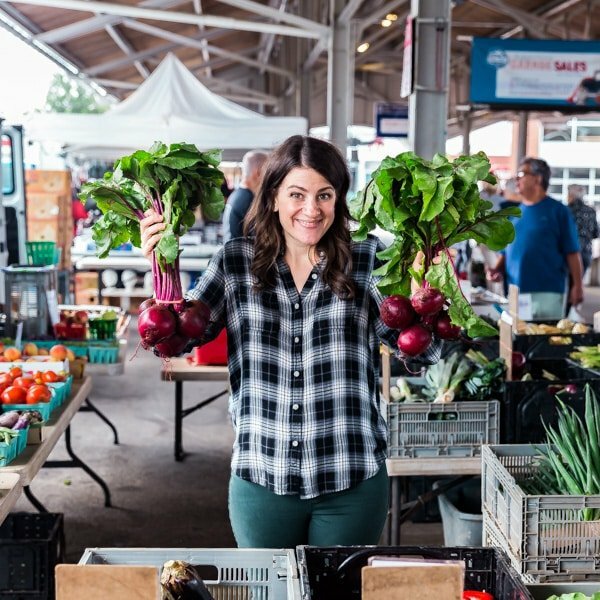 It’s all about delicious food with minimal prep, no pre-cooking, the ability to freeze for a great make-ahead meal. 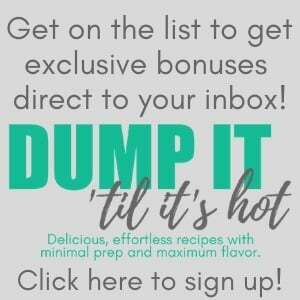 And this recipe checks allllll those boxes! 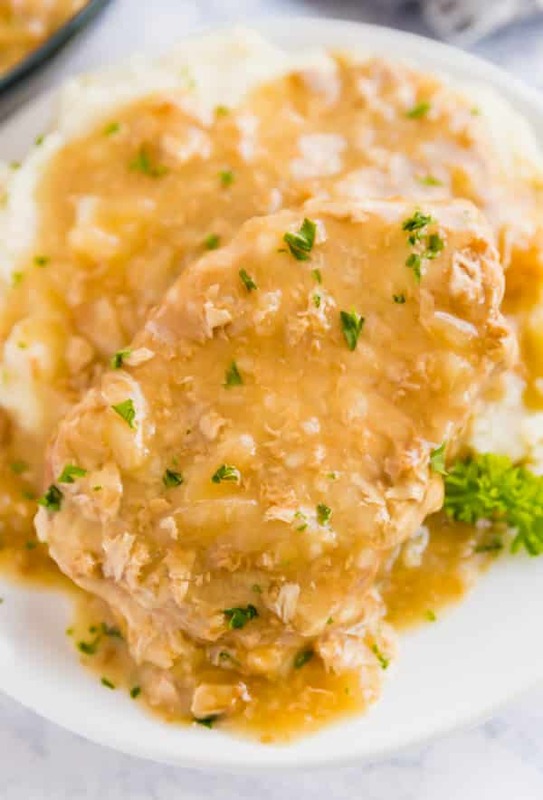 This Smothered Pork Chops recipe is one I’ve been making for a while. You throw a few ingredients into the crock pot (or instant pot!) and let it do the rest of the work.And the results are fall-apart-tender pork chops with a stick-to-your bones gravy that the whole family will go nuts for- just like mine does! Be sure to use low sodium broth- the onion soup seasoning had a good amount of sodium and I’m found that using the full sodium broth makes it a bit too salty. You don’t even have to stir the ingredients when you place them in the pot- just place the pork chops in, sprinkle with onion soup seasoning and pour the broth over the top of it all and cover the pot! I add a slurry of cornstarch and water to the pot 30 minutes before the cooking time is over and turn the pot to high to thicken the gravy. Can I use bone-in pork chops? Yes! This recipe works great with bone-in or boneless pork chops! 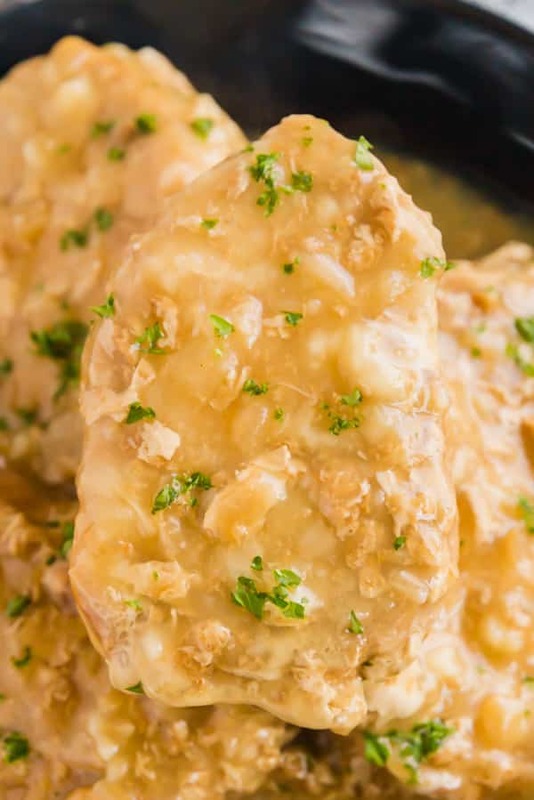 Can I freeze crock pot pork chops? Yes, but they’re best frozen before cooking. Place all ingredients (except the slurry mixture) into a plastic zipper bag and freeze flat. Thaw before cooking. How long do you cook crock pot pork chops? Around 8 hours on low. This recipe is pretty flexible, so if it goes longer, it won’t adversely affect it. 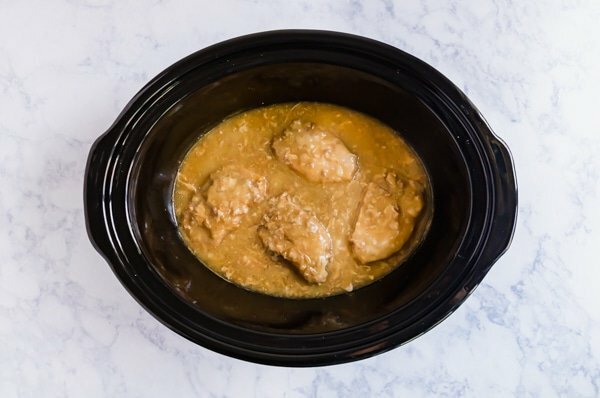 Can I put frozen pork chops in the crock pot? Technically you’re not supposed to (from a food safety standpoint) but I have before with great success. Use your best judgement and common sense. Sear the pork chops before placing them into the slow cooker (if you’re using an instant pot, you can do this on the saute setting). Strain the juices through a strainer before thickening the gravy. 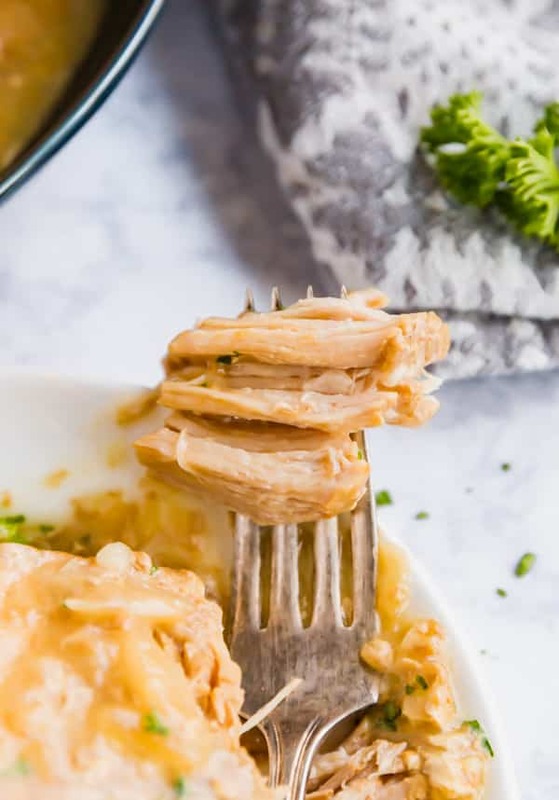 You can also thicken the gravy in a small pot on the stove instead of the slow cooker (or on the saute setting in your instant pot if you’re using that). 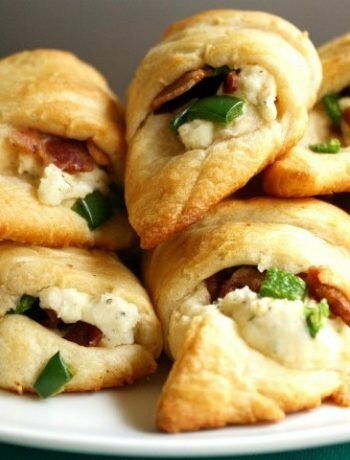 I like to serve these over mashed potatoes with a salad on the side- you can always use pre-made mashed potatoes and salad kit from your local grocery store for minimal effort if you don’t want to make one of the below recipes. 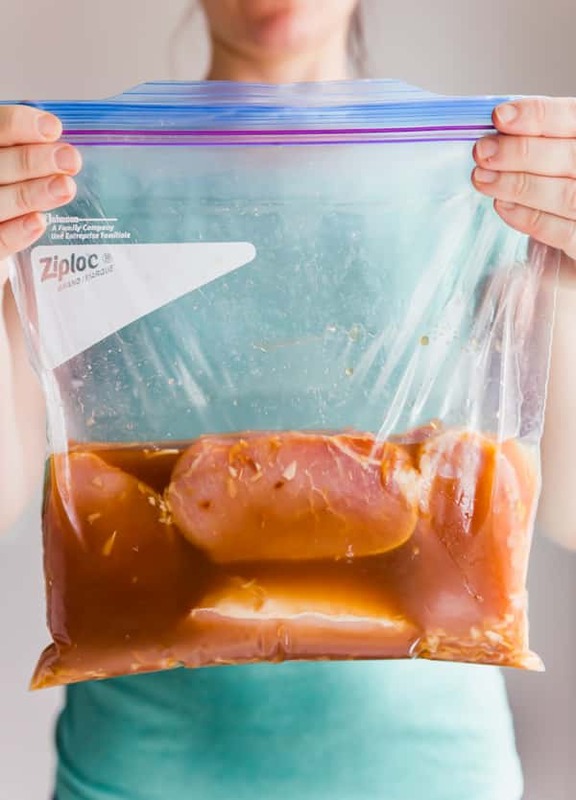 Place pork chops, broth and onion soup seasoning into slow cooker pot (or a zipper bag and freeze- thaw before cooking). Cover and cook for around 8 hours on low. 30 minutes before the pork chops are done cooking, whisk together corn starch and water and pour into the slow cooker. Give it a quick stir to combine, cover and cook for 30 more minutes on high to thicken. Cover with the gasket set to sealing. Set the instant pot to high pressure for 20 minutes. Once the cooking time is up do a 10 minute natural release and remove the cover. Turn off the instant pot and turn it to the saute setting. Whisk together the corn starch and water and pour into the pot. Stir to combine and simmer for a couple minutes until thickened. Serve immediately with mashed potatoes. 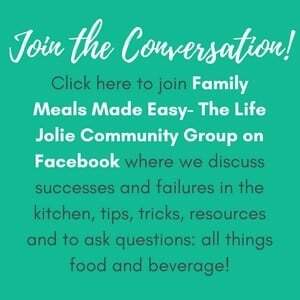 Now that you know how to make Smothered Crock Pot Pork Chops, be sure to share them and tag @thelifejolie on Instagram and Facebook. And be sure to pin it to save for later or bookmark it! August 30, 2016 at 9:43 am Thank you- this is definitely one of them- enjoy! August 30, 2016 at 9:36 am Thank you! November 15, 2016 at 7:53 pm Made this today for my fiancé. Was a little worried about the 8-10 hours cook time, but the chops were fall-off-the-bone. So good!! Excellent gravy, too! Thanks for the suggestion. November 16, 2016 at 9:01 am I'm so glad you loved it! The first time I cooked it that long was an accident- I we were all running late after a busy day at work. I was so nervous that dinner was ruined but once I tasted it, I started cooking it that long every time because it was even more tender! Thank you for sharing your feedback! December 18, 2016 at 9:27 am This will probably be a silly question, but where did you find the onion soup seasoing? I'm hoping to try this tomorrow. It looks delicious! December 18, 2016 at 10:39 am Not a silly question at all- they have these dried soup mixes in the section of my grocery store where the canned soups and stocks live. I hope you love it! March 14, 2018 at 10:28 am Can I add 1 packet of dried ranch seasoning to this along with onion soup mix? March 14, 2018 at 10:52 am I haven't tested it but I'm sure you could. My only concern is that it could be a bit salty with both packets but it's worth a try. Please let me know how it turns out, I love the idea of the ranch flavor! 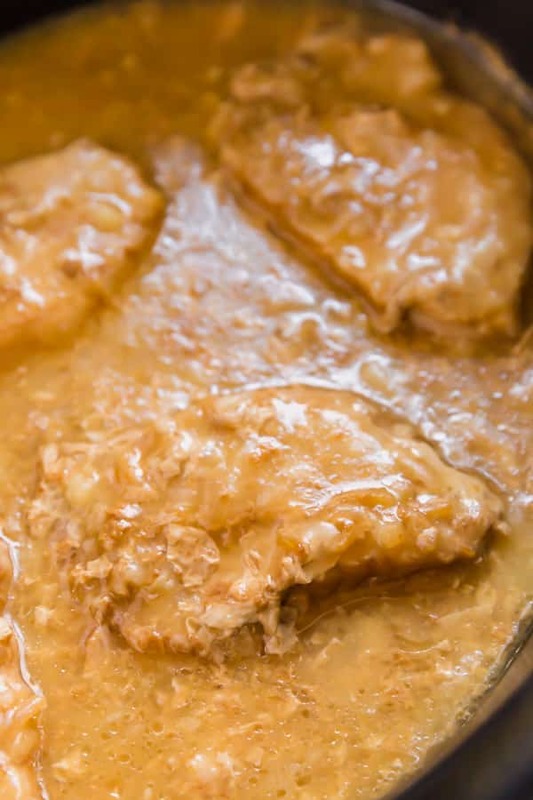 February 4, 2019 at 2:58 pm I usually manage to turn pork chops into shoe leather, so this will be right up my alley! February 4, 2019 at 5:07 pm Me too- but these always come out tender! February 6, 2019 at 4:38 pm What a great dinner! Such good and easy comfort food. February 6, 2019 at 11:05 pm Thanks so much!